Spring is quite the little trickster, she is. On Friday, she brought us weather so warm that Clif and I raked part of the back lawn, and we didn’t even need to wear our jackets. But Saturday arrived with a cold rain. 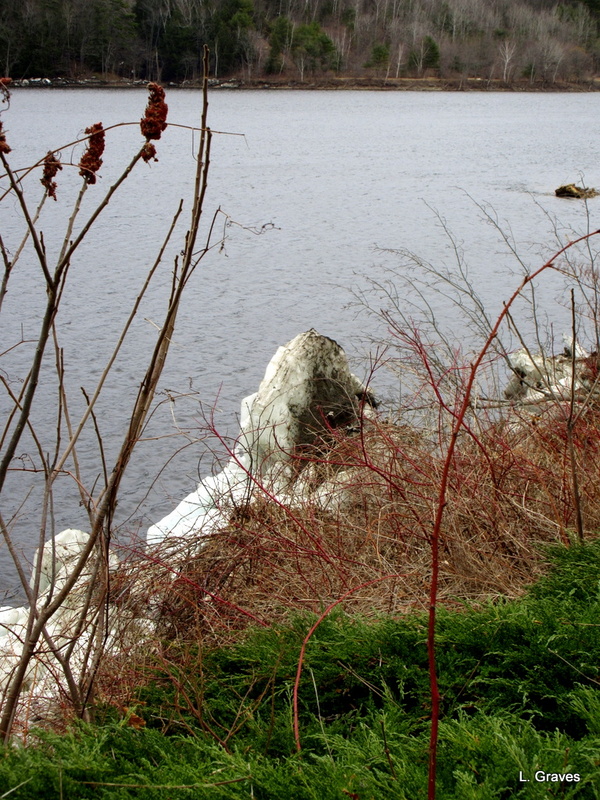 On Sunday it became even colder, and the rain turned to a freezing drizzle. 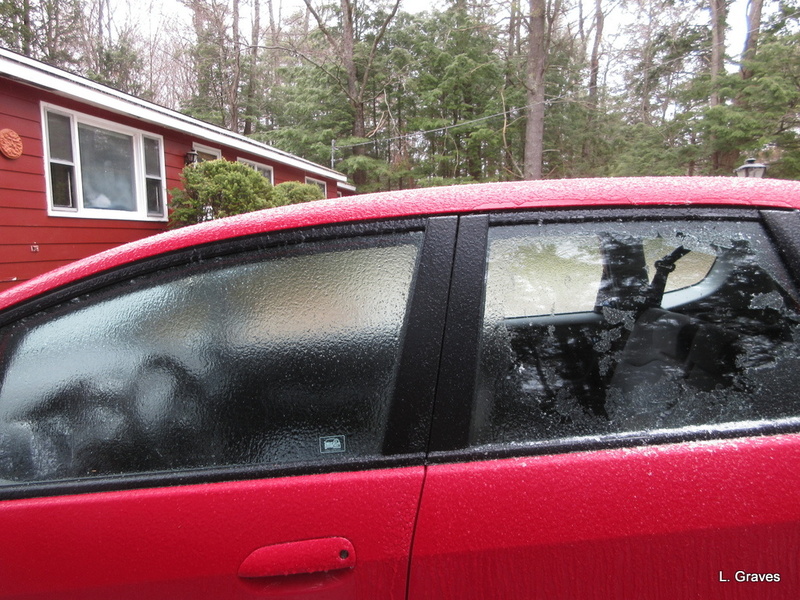 This is what our car looked like this morning, with one window scraped and the other left untouched. But progress has been made. 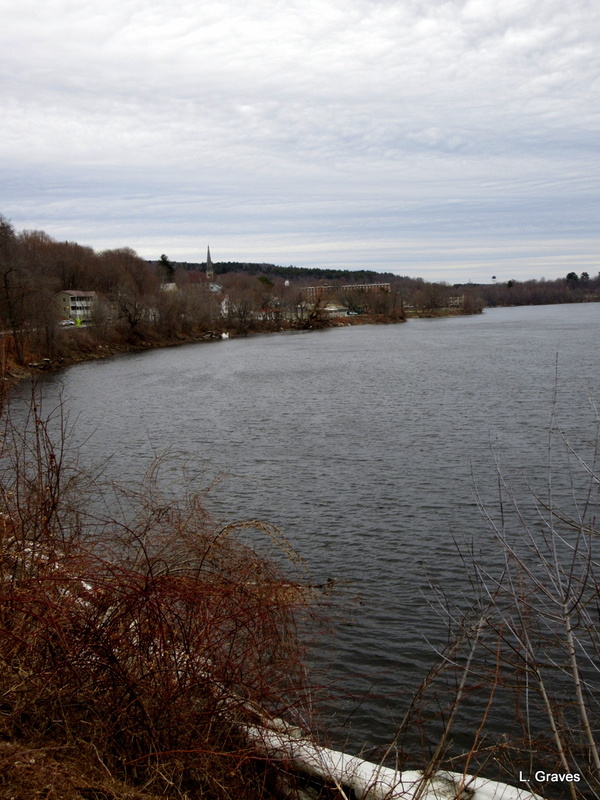 Here is a shot of the Kennebec River. 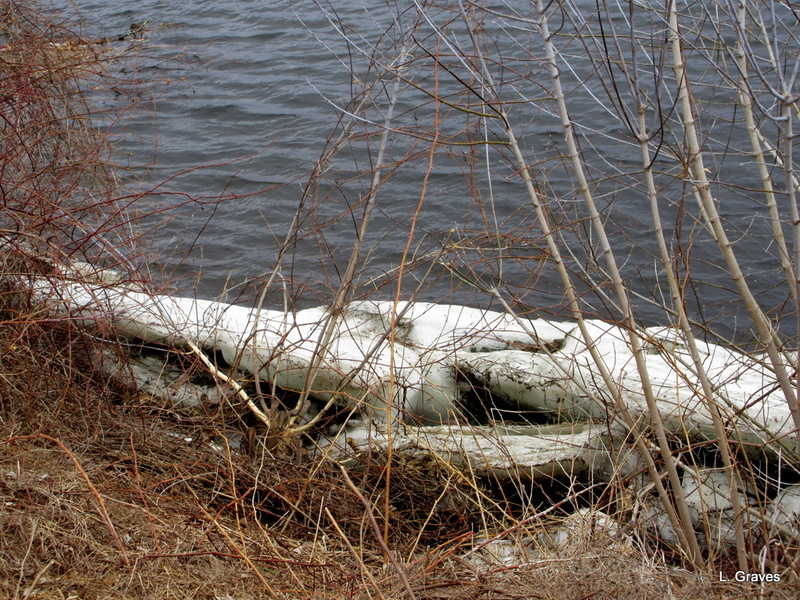 There are still ice chunks along the banks, and I wonder if they will be there until the end of April. They are so thick! The one below looks like a mini-iceberg. Here is another view of horizontal ice chunks. 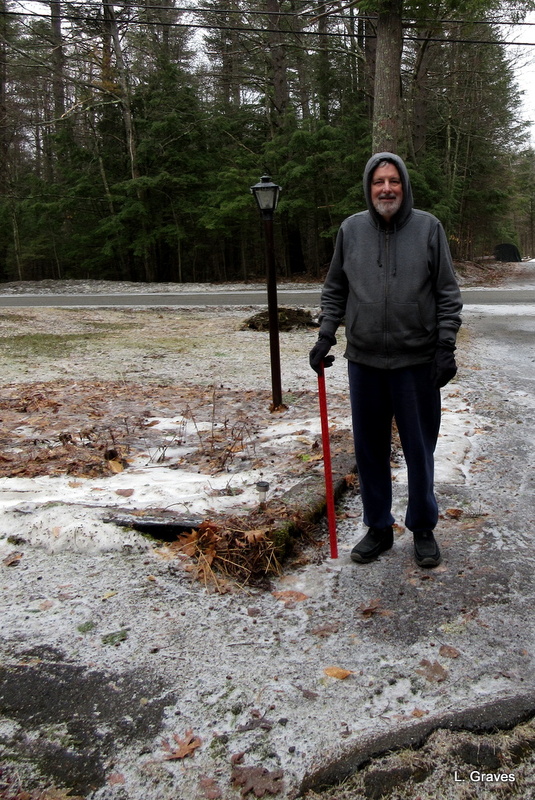 Despite the miserable drizzle, our yard is nearly snow free, and snow-gauge Clif’s job is coming to an end. Next week, perhaps, depending on what Spring has up her sleeves. Come, Spring, Come! We long to see your pretty face. Freezing rain is the worst!! Wishing some warmer weather your way!! Spring is eventually going to settle in for sure! Thanks, Shannon! Winter just won’t let go. Hear, hear! I am trying to keep a good face on this latest from Ma Nature, but sigh, I’m ready for warmer days. Hope Spring comes soon for you. Great idea! This sort of weather is very unusual in April, even in northern New England. Thanks, Xenia! Hope it gets here soon. You do well to keep smiling. It must stop sometime. I hope the freezing rain is gone for this year. It has been really cold and icy here this weekend. After two gorgeous days last week, we pulled out our winter jackets again. Went to visit a friend yesterday, and on the way home, the driving was terrible. Sigh. This sort of thing should be done by April, but Mother Nature has other plans. 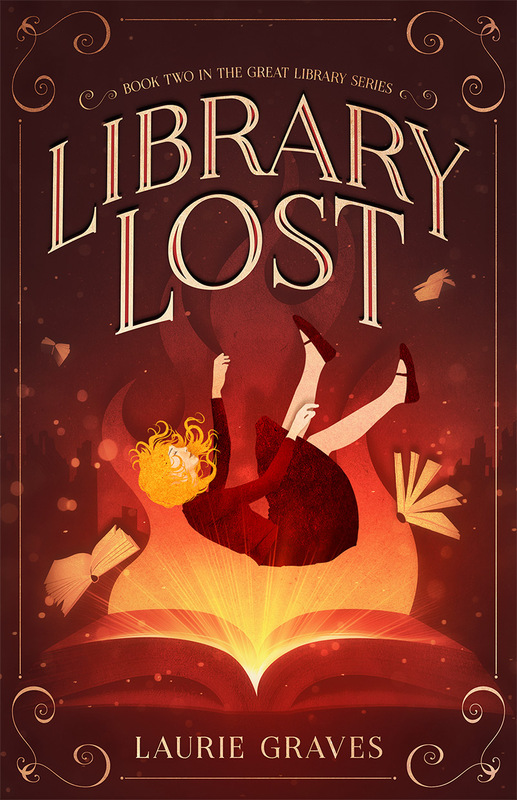 A few more days and we should get a reprieve, right?! That’s what we’re hearing! Your last line reminded me of the book “Come Spring” describing how the early European settlers in Maine would be desperate for something fresh and green to eat this time of year. At least we don’t have to worry about hunger as well as cold! Yes, I think that was true of agrarian life in general. My grandmother grew up on a farm in northern Maine, and she was the least fussy person I have ever known. I can’t recall that she ever disliked any kind of food. Makes a difference when you grow most of what you eat. No surprise that she loved dandelion greens. Let’s just say that the rest of us weren’t quite as enthused. How disappointing! The cold just won’t take the hint it’s not wanted any more. Clare, you got that right! God, I hate scraping ice off of cars.